Put on something green and go to Crosslake to kick off the St. Patrick's Day festivities at Common Goods during Business After Hours on Tuesday, March 12, 2019 from 4:30 – 6:00 pm. Attendees will enjoy free beer, wine and snacks while shopping the #1 Thrift Store in the Brainerd Lakes Area! 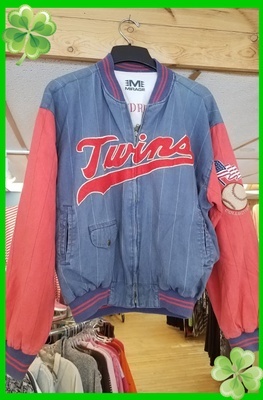 Grand prize provided by Common Goods will be a vintage Twins reversible jacket commemorating the 1966 season. The lucky guests who wear green will have their names added to a drawing for a fun prize! Common Goods is a trendy thrift store for the community-minded shopper. Common Goods offers fun, hip, high-quality goods at reasonable prices, including clothing, fashion accessories, casual and one-of-a-kind home furnishings, and unique furniture pieces. Common Goods was named the #1 Thrift store in the Brainerd Lakes Area and one of "11 Incredible Thrift Stores in MN". Proceeds from Common Goods stay local and support local families being served by Bridges of Hope.